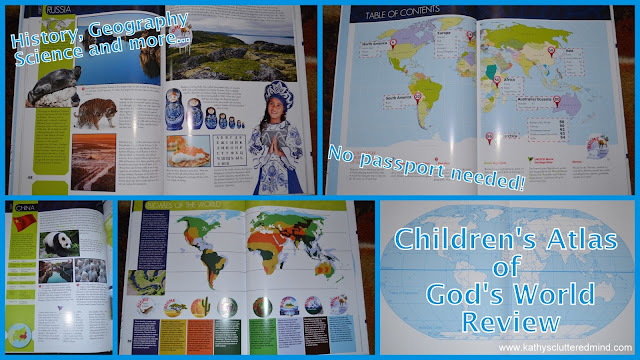 This months Moms of MasterBooks book was the NEW Children's Atlas of God's World. Below is my review about the book as well as further details about this months Facebook party. To read more reviews visit the NLPG Blog. Craig Froman has done it AGAIN and created yet another fabulous book! With the Children's Atlas of God's World your family will travel around the World without having to leave your sofa! No passport is needed to jump into this big 10″x14″ book. There are 94 pages filled with information on the 7 continents as well as 22 countries. Families will discover the diverse cultures, holidays, natural wonders and historic sites. There are loads of beautiful maps which detail major cities and geographical information. Your family will learn about the longest rivers, tallest mountains, Christian explorers, missionaries, God's creatures, biomes and much more in this book. The graphics in this book are beautiful photographs from all over the world! In the front of the book is a great introduction which I highly suggest reading. This section will help you answer questions about maps, time changes, oceans and God's wonderful plan. Each page includes numbered pins, colored flags and other markers to highlight key information as you progress on your journey. After the introduction you will learn more about this key and how to use it in the Table of Contents. Blue Flag With Cross - this marks Christian History and Tradition. When you see this flag you will learn about Christian history, people of faith and Christian traditions around the world. Red Numbered Pins – when you see a red numbered pin, you will find the number pin on the map marking a landmark, river, or other geographical location. Green Highlights - words that are highlighted in green indicate cities or sites you can find on the map. Green Flag with Letter - this marks UNESCO World Heritage Sites. This flag indicates there are special sites recognized by the United Nations Educational, Scientific and Cultural Organization. Biomes symbol - look for the circle with an animal(s) and biome in red letters. When you see this symbol you will learn about habitats around the world, including forests, deserts, grasslands, tundra and more. Also in the Table of Contents is a large map with each of the countries labeled. The page numbers for the continents as well as the various countries are also indicated to make it easy for you to jump around as needed. On the left side of each country page you will find a picture of the country flag as well as its meaning. And a section with quick facts about the country such as the capital city, population, government system, primary language and more. Biomes of the World - which is a fabulous resource for science studies. We will actually be learning about biomes this year so this will definitely be of use. Glossary - which includes terms like geyser, isthmus, plateau and more. Government Systems - this section includes definitions for various government systems around the World (only for countries found in the book). Government systems such as democracy, communism, monarchy and more are discussed. Holidays Around the World - "holy days" are days of celebration or honor or remembrance, for families, people groups or nations. Included in this section are a few special days from around the world. Index - a very comprehensive index to make it easy for you to find exactly what you are looking for. And lastly in the very back of the book of the book is a black map of the World. This map can be used for labeling/coloring! The countries are too small to write names in, but you could number them and then have the kids answer on a sheet of paper...that way you can use it over and over again to quiz the children. This book is great for children of all ages (my 5 and 7 yr old loved it). Both of my children were really excited about this book and it is one we will definitely be utilizing a lot this year for our history, geography and science unit studies. Why: To discuss great books, fellowship with other moms and win great prizes. Prizes include copies of Children's Atlas of God's World and more. As well as some goodies from the treat sponsor. You can purchase the Children's Atlas of God's World for $18.99 at New Leaf Publishing. The digital version is $9.99. You can also get the book on Amazon for $13.67 (current sale price).